This site lists clues to the boxes I have placed throughout the United States, primarily in the metro Richmond, Virginia area. 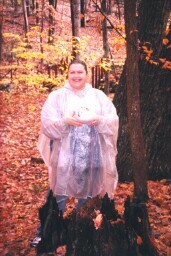 I've been letterboxing since July 2002. On the Yahoo! letterboxing newsgroup, my handle is mlgainey. My personal stamp is a Mason jar, usually stamped in blue ink. If I am stamping into a microbox, I use a little store-bought stamp of an Alaskan petroglyph. And if I have my coonhound Bonnie with me, I stamp her in, too!